First how to constraint an entity with in tolerance rather than completely fixing it? i.e. how to define a certain range of motion for an entity beyond which no movement would be possible? Second how to fix an entity only in one direction of an axis but not the opposite one, e.g. fixing a node in +Y yet allow it to move in -Y? Why may this be useful? Gap elements have many great uses, especially when you want to quickly and relatively easy calculate supports that are ineffective in one direction. They are also useful if you need to have a sliding connection between 2 elements. As the name suggests you can define the “gap” that needs to be closed before forces are transmitted! Why can support be ineffective in one direction? I will stop here for a second, to explain why supports can be ineffective, and what does it really mean. 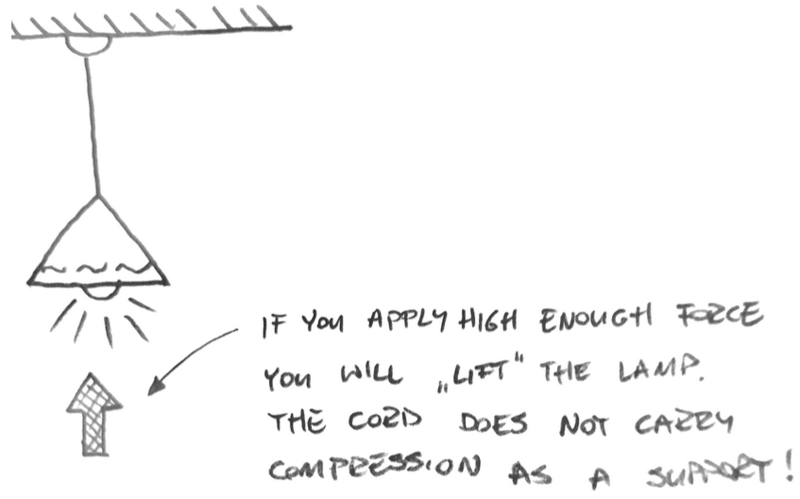 Usually, this is explained in terms of tension/compression problems. It simply stands on the floor, and the fact it is not going “deeper” into the floor means this is a support. In fact, this is a very strong support. If you would apply a compressive load on the flower (who would love to squish such a beautiful thing ?!?) it would resist anyway. It is actually astonishing how much load you can apply on such support! But if you would apply tension to the flower (gently and by the pot!) 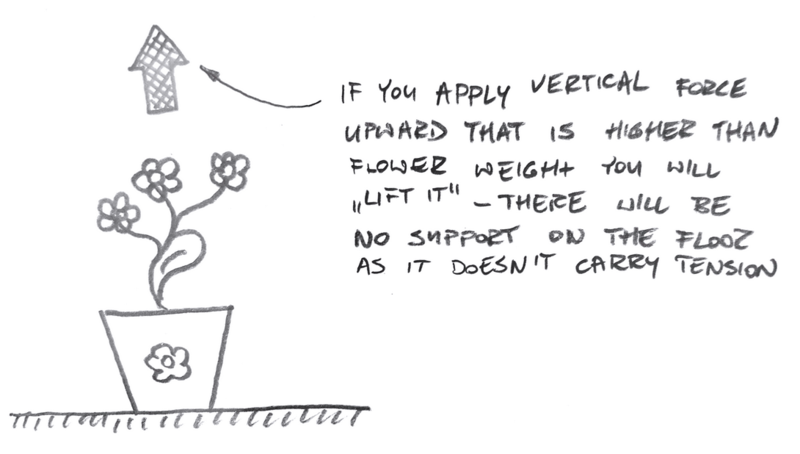 you would simply lift the flower up! In such case, there is no support there at all! This is basically what an ineffective in one direction support is. I would say that support ineffective in tension like this one is the most popular type, but there are plenty more. You know I can’t resist making bad sketches so here we go! I have already shown you the support ineffective in tension (aka “flower support”). But of course, there are more. If you apply enough vertical force upward you will “lift” the lamp. This means that the cord is a support that only works in tension! But of course, this is not all! Similar things can be made for bending and this can sometimes catch you off-guard. We already discussed how such connections work here. In short, the moment is divided into a pair of forces. 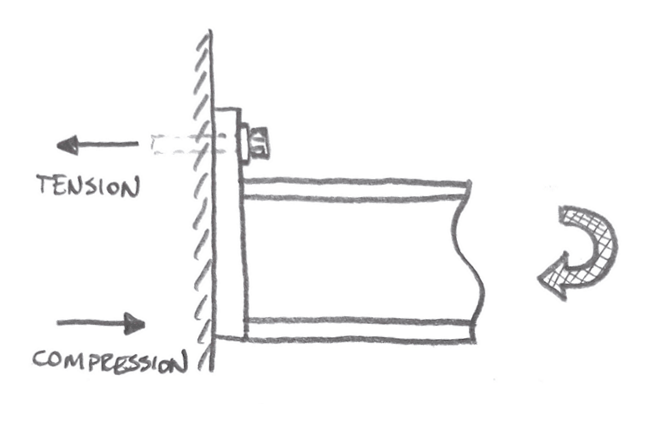 Tension goes into the wall thanks to the bolts, while compression is simply carried by contact between the end plate and the wall at the bottom. The fun starts when we switch the bending direction. In such case, the connection is hopeless, as there are no bolts to carry tension at the bottom. Such support is ineffective in “upward” bending direction! There are plenty more possibilities, but those are the main ones. The second part of the question was about gaps in supports. Simply put sometimes support can start working only after a certain deformation takes place, as I described here. The simplest example of such support would be a cantilever with additional support. If fact I will use this example in Femap to show you how things are done! 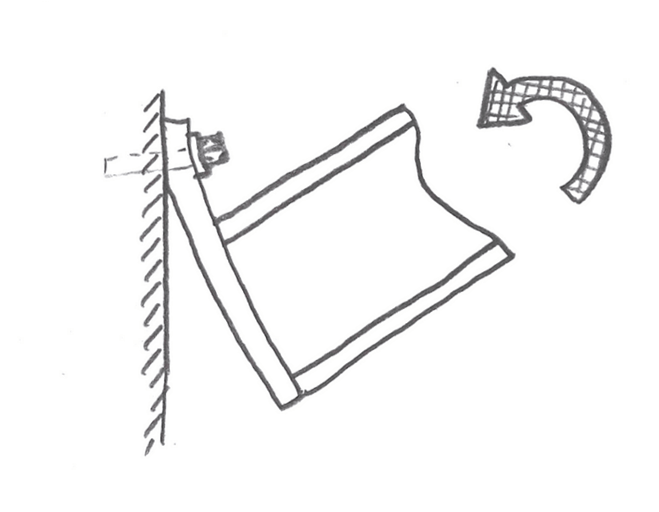 In such example, you can see that firstly the cantilever will deform (maximal deformation at the end). But later, when the gap will be closed, this will start to work as a simply supported beam. In such case, deflection will increase in the center of the beam, rather than on the rightmost edge (it will already be supported at that stage!). Note also, that I draw the “additional support” only at the bottom of the cantilever – if the force will be upward there is no support at the end at all! Gap elements for the rescue! I just want to say that I think what you are doing here is great. I’m always extremely captivated when reading your posts. Thank you so much for the encouragement – this means a lot! Your way of explaining the topic is excellent. Thanks for the blog. Nice post! I am trying to create a small program in Microsoft Excel (for optimization purposes), in which I need to use something like a gap element. Do you know how I could do this? I’m struggling to understand the degrees of freedom and how to build a gap element into my stiffness matrix. I’m really happy that you like it! Sadly I’m not sure how to help you. In truth I have never tried to write my own FEA code – so I have no experience here. I really do hope you will find some help somewhere! Good luck! Great stuff as always Lukasz!